New Posh signing Alex Penny during last night's match with Ipswich. Photo: Joe Dent/theposh.com. Peterborough United have snapped up defender Alex Penny from non-league Nuneaton on a three-year deal. Posh have paid an undisclosed fee for the 20-year old who is most comfortable as a right-sided centre-back. Burnley and Leicester were believed to be interested in Penny who started his career at Hull City. 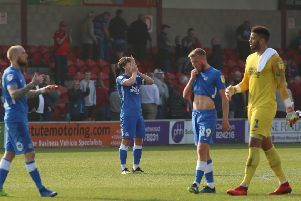 The Peterborough Telegraph revealed Posh’s interest in the player last week. He played an hour of last night’s friendly against Ipswich.